If you cook with recipes, you're not going to get very far without a good set of measuring cups. A basic set will have 1-cup, 1/2-cup, 1/3-cup and 1/4-cup, although it's also useful to 2/3- and 3/4-cups. 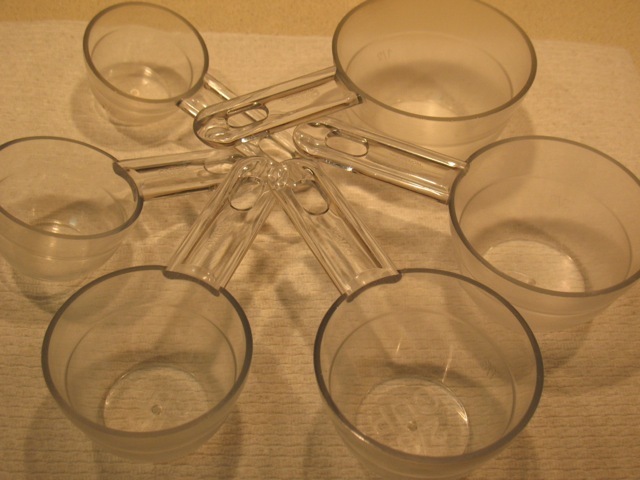 I really love my set, which are made by Pyrex, but unfortunately no longer in production. They are clear, made of lexan plastic, so they won't shatter if dropped and you can see through them, which is useful for making sure brown sugar is fully packed, for example. They are flat on top, which is essential for leveling ingredients. An added bonus of these is that they have a line halfway up each cup which allows you further measurement options, useful especially when dividing large recipes. If I had a nickel for every time I've washed these measuring cups, we'd be part of the 1 percent.